It’s definitely that time of year when the bar-b-ques are working overtime in the neighborhood — especially in your own backyard. 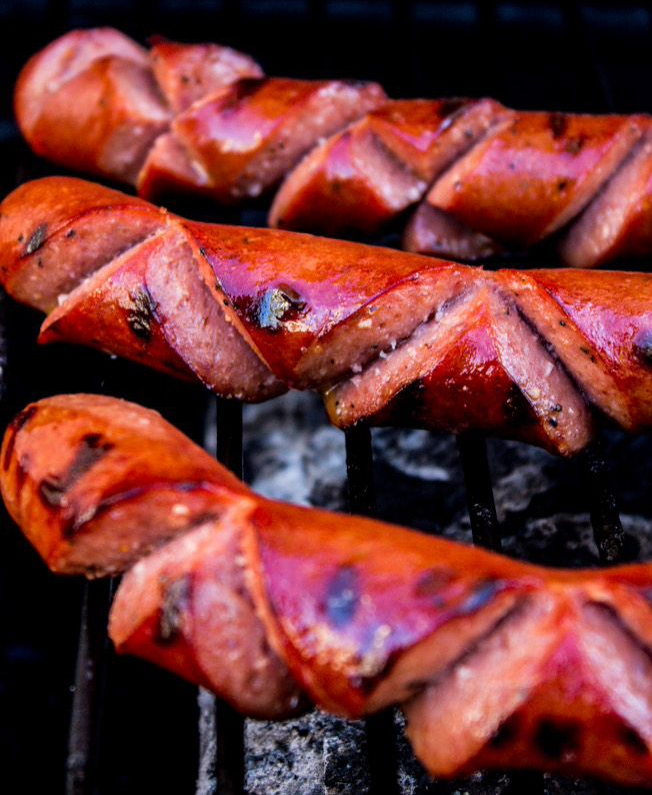 Hot Dogs seem to be on the grill as much as hamburgers, chicken and steak. But, as you can see from this picture it’s the cuts on the hot dogs of your choice that brings out the best tasting hot dog this side of heaven. And, you add some excellent sauce along with onion, cheese, or sauerkraut, banana peppers, even pickles or sweet pickle relish . . . getting hungry? One neighbor swears by this sauce that has been handed down in his family. It’s important to allow people to talk . .. and talk they will. As it turned out, it’s not actually a secret family recipe, but a recipe his grandmother clipped out of the newspaper back in the 50’s. Now that I think about it, it may be a secret family recipe, because we don’t know the newspaper and don’t necessarily want to look through newspaper archives . . . and you never know what dear ol’ grandma added or deleted or substituted from the original recipe . . . or how it changed over time . . . Put all the ingredients in a small saucepan and set over high heat. Stir occasionally until the mixture just starts to bubble. It’s up to you if you want to serve your sauce at room temperature or chilled. Let’s get down to the hot dogs!! You’re going to want to set your grill to medium heat — that’s if you have one of those fancy pants bbqs. For the rest of us . 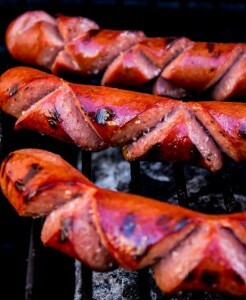 . .
Use a sharp serrated knife to make diagonal cuts into the hot dog. You’re going to have to cut deep into the hot dog, more than halfway through. You’re going to make large “V’s” or “W’s” all the way down the hot dog. Check out the picture at the top of this blog post. Grilling is up to you. Some like to grill the hot dogs to black, some just with some black spots. You will notice that the hot dogs will be curling up into happy faces. That’s because of the cuts. Indulge me for a moment to talk about the buns you choose. 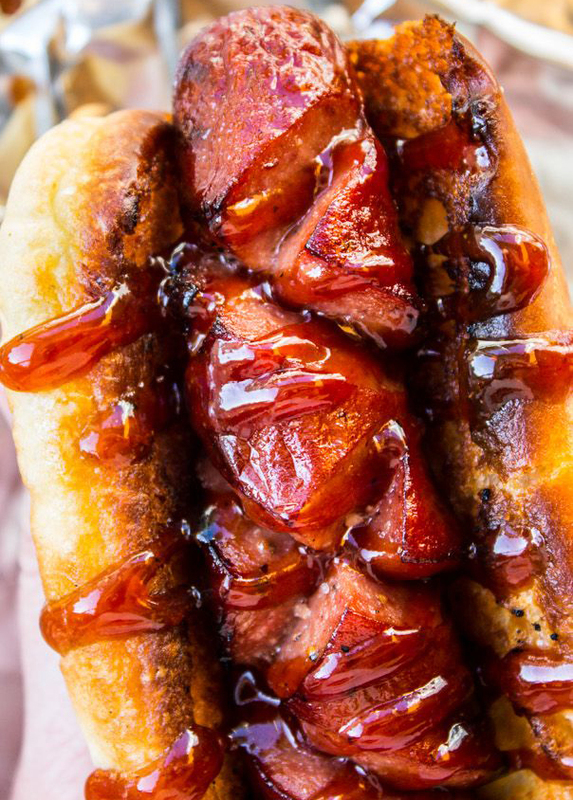 Now, for this to be a Heavenly Hot Dog, not just any ol’ bargain bun will do. You want something soft, that truly hugs the hot dog and gives you a soft blend of flavor . . . not just the bun . 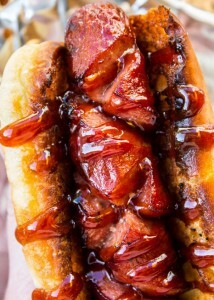 . . you want it to compliment the hot dog, sauce and other stuff you may add inside the bun. You’re going to butter your hot dog buns and place them on the grill just long enough to get them a bit toasted on the edges. Now, you’re ready to put the hot dog in the bun, top with the delicious sauce and any other toppings you desire. If you don’t plan to serve them right away, wrap them in aluminum foil to keep them warm. Every once in awhile a recipe comes along that knocks your socks off. 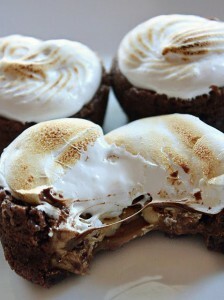 With all the variations of S’Mores, they may have come a long way from the original, but it may be trying to improve on the original. In any case, I’ve come across a great easy recipe that you can mix up and make your own variations to . . . but the major thing is to put marshmallows on the top and toast them to the consistency we all find absolutely delicious. Yummmy!! Your family will be asking for s’more. 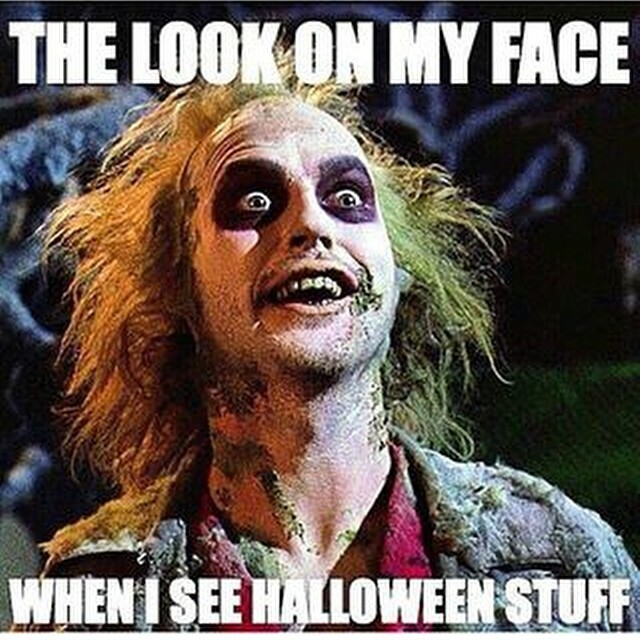 I was visiting Pinterest and I noticed all the holiday stuff, especially Halloween. 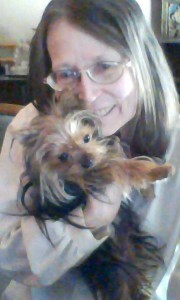 Then there was lots of Yorkie stuff, too. At the bottom of the post were the words “recommended for you.” Well, that solved the mystery of why there were pins that spoke to my interests . . . but it was a bit spooky, too, when I realized that Pinterest took notice of my viewing habits. Maybe I should feel flattered, but I am a bit too creeped out right now. I enjoyed the assortment of pins, not those that were specifically recommended for me. Technology is great, but maybe it’s time for me to clear my cache and see how the recommendations go. Variety is good. That’s why I followed some board. I’m curious to see if others have experienced the same thing. Please leave a comment and let me know your interests. I find it fun to keep the excitement of Halloween available all year round — especially when you’re watching a scary movie or just want to put a bit of a twist on a regular snack — it’s the spirit of the thing that counts. I can’t believe I’m getting into the spirit of Halloween before summer! It may have been creeping in from time to time . . . it’s just such a fun holiday. Many of my friends can’t wait a whole year until Halloween rolls around, so they have various Bewitching Masquerade Parties. It’s just an excuse to have a Halloween Party to celebrate every season and any time when the mood strikes to have a party with all the Halloween fun they seem to enjoy. If you’ve been looking for the link — click the picture. It’s been there all along. If that doesn’t work for you . . . click here It’s the whole Bewitching Masquerade Party Kit of wonderful printables you’ll enjoy over and over again. Be sure to bookmark this page or the link. You’ll want to visit it from time to time. It’s truly amazing what you can find at Thrift Stores or after the season sales. I know, too much junk and clutter, but you can put it to use by making holiday wreaths. You can make them up and sell them. 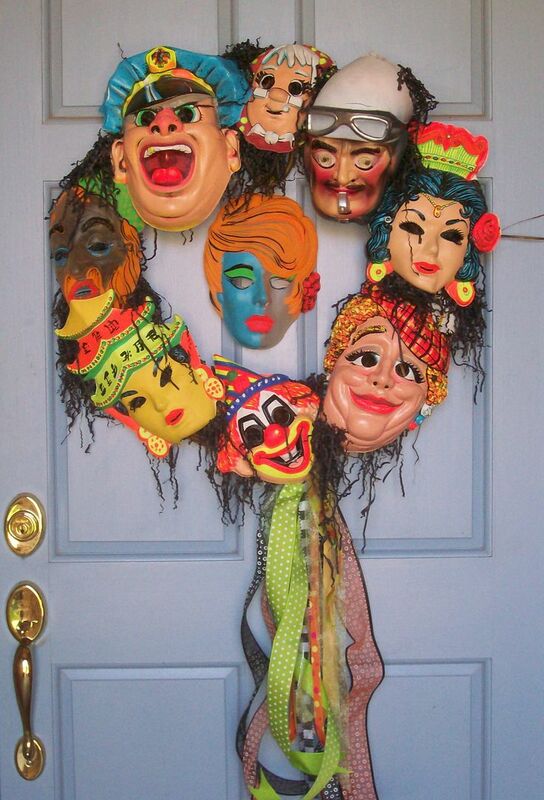 You wouldn’t believe how many times someone has knocked on my door wondering where I bought my wreath. When I tell them I made it, they immediately ask if they can buy it. I do keep a running tally of what it costs for me to make my holiday wreaths, so when the opportunity arises for me to sell one, I multiply my cost by 5 and I have a price — and sometimes I jack it up quite a bit . . . you don’t want to sell your talent too cheap. I usually sell my wreaths from $25. and up. Sometimes I get things for nothing. Some people at garage/yard sales give away a lot of stuff by the box. Just be sure to look for stuff in the off season for the best bargains. Have fun finding trash that you can make into a fun front door wreath.